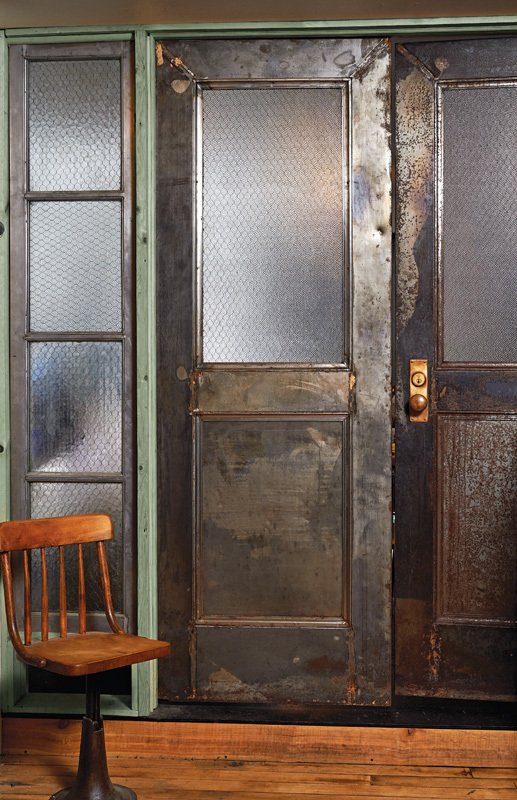 Entry door, glass panel, and 1870s hardware all were salvaged. 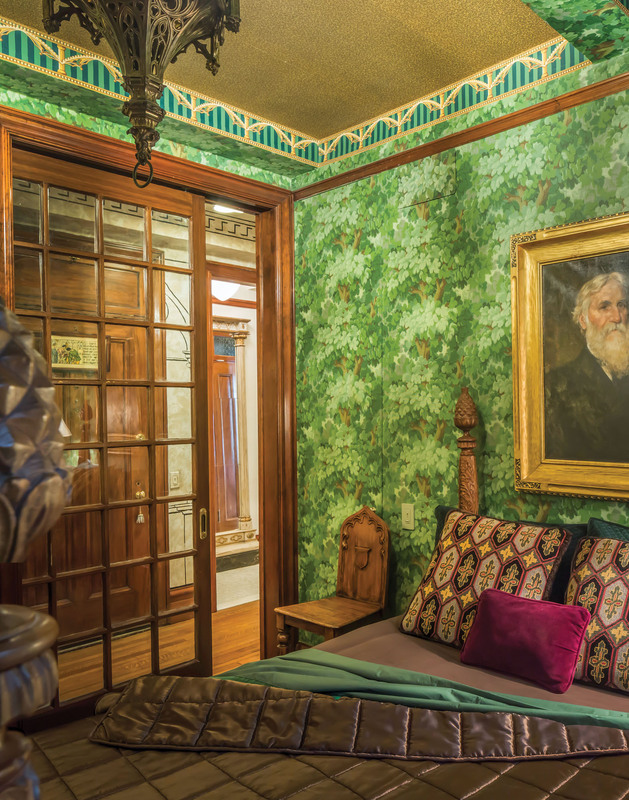 The entry was looking better: The homeowner had hung a salvaged antique door of the late 19th century, and he’d even upgraded it with a stained-glass panel. Still, it looked unfinished. Aha! The hardware—it needed to be heftier, eye-catching, and welcoming. A handsome 1870s set with a thumb latch and pull was spotted in a local salvage shop. Cast in brass, an Anglo­–Japanese fantasy of stylized flowers, tassels, a duck swimming in a pond, and a pagoda…who wouldn’t open that door to find out what lay beyond? 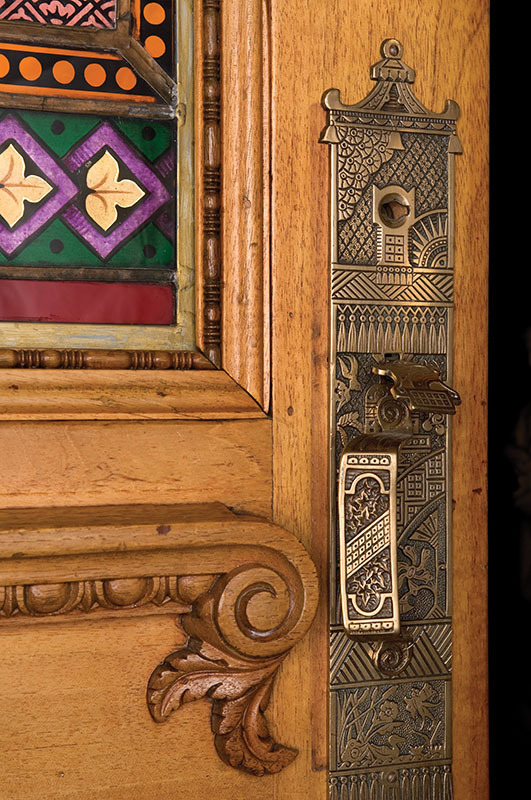 A pair of bronze hinges, also in an Aesthetic Movement design, provided the final touch of authenticity. Using old hardware requires some forethought. Knowing that 19th-century back plates or escutcheons were often large, the owner measured to be sure it would fit comfortably without intruding on mouldings or panels. Next he measured its placement from the ground up, and marked where the door would need to be mortised (cut into) to accommodate the lockset; 36–38" is a standard height. This pull came with a complete lockset that was in working order, but all the parts needed thorough cleaning. First step: disassembly on a level surface, with the plate removed and the lockset’s interior workings documented on a cell-phone camera to aid reassembly. Clean parts with a paint thinner-saturated rag. Then, to lubricate, sparingly apply white lithium grease to springs, points of wear, and moving parts. Carefully chisel and drill out the door to install the lockset; the strike plate will be set into the jamb afterwards for precise alignment. To make sure the back plate has a smooth, flush fit, slightly recess it: Faintly outline it in pencil on the door face, then lightly scribe it to a depth of 1⁄16" with an X-acto knife. Carefully chisel out a recess of approximate 3⁄16" into which the plate is settled. Use straight silicon-bronze set screws to attach the plate, adding strength along with appropriate detailing; carefully turn and tighten screws by hand (no power drill) to avoid stripping them. [Buy silicon-bronze screws through jamestowndistributors.com.] Although the vintage hardware still locks, this owner added a small modern deadbolt above, not visible in this closeup, for extra security. Old conservatory windows found at a salvage yard became pocket doors separating bedrooms.